The Standish group reported in 2009 that only 32% of IT projects were considered successful, leaving 24% to be cancelled before completion and 44% considered challenged. For many troubled projects, the source of the problems can be directly linked to a failure in implementing basic project management processes. Let’s get back to the basics. 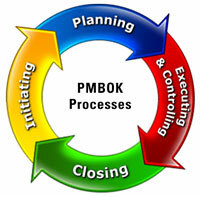 Here are the five basic processes for project management. Based on the PMI standards, as defined in the Project Management Body of Knowledge (PMBOK), these five high-level processes are a framework for managing projects and are scalable to any type or size of project. Each process builds on and interacts with the previous one. This is the process by which the project gets started or initiated. This might be through a business case, statement of work or other document that contains the project scope, expected budget and acceptance criteria. The information contained in the initiation documents becomes the defining elements of the project planning process. The plan is derived from the information included in the initiation documents. Planning for the project includes things like the Work Breakdown Structure (task list), Resource/Schedule Plan, Change Management Plan, Quality Plan and Communication Plan. • Communication plan defines how the project will be reported on and to whom. Executing process is working the plan(s) that were created in the planning process. The plans are put into actions and the work begins. The execution of the plan may exist as one or more iterations of planned cycles. Monitoring and controlling plan(s) involves monitoring of work progress and budget spend, as well as controlling any changes involved in the Execution process of the project being executed. Controlling of changes should follow the process that was outlined in the Change Management Plan. Monitoring includes any status reports, matrix, or communication artifacts that were defined in the communications plan. Quality monitoring/controlling, should follow the process that was outlined in the quality plan. Project closing process works to ensuring that all the work is complete, as defined by the deliverables, the initiation documentation and any resulting change requests. This include getting customer sign-off for the deliverables, closing out the budget, defining any follow on actions and reviewing lessons learned. While these processes may be familiar and simplistic in nature, they are often not fully implemented or practiced to a level that can be documented or repeated. This leaves the project to be managed without the basic elements that will help make it successful. Most troubled projects can be brought back on track, by simply assessing the basics and defining the missing or lacking processes. Let’s get back to the basics. How are these basic processes affecting your projects?